1. 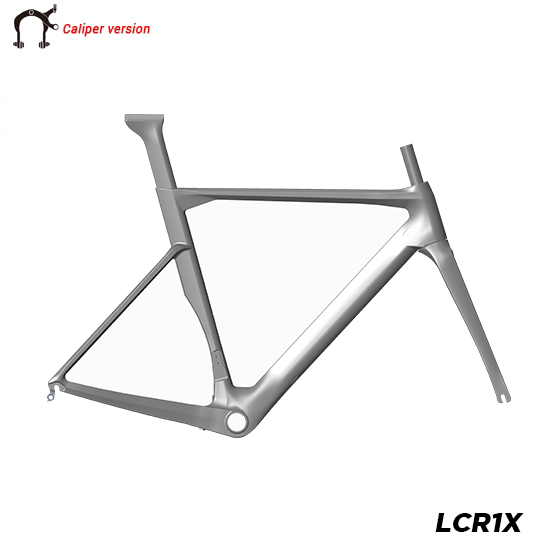 Check whether there is air leakage when the carbon frame is formed. 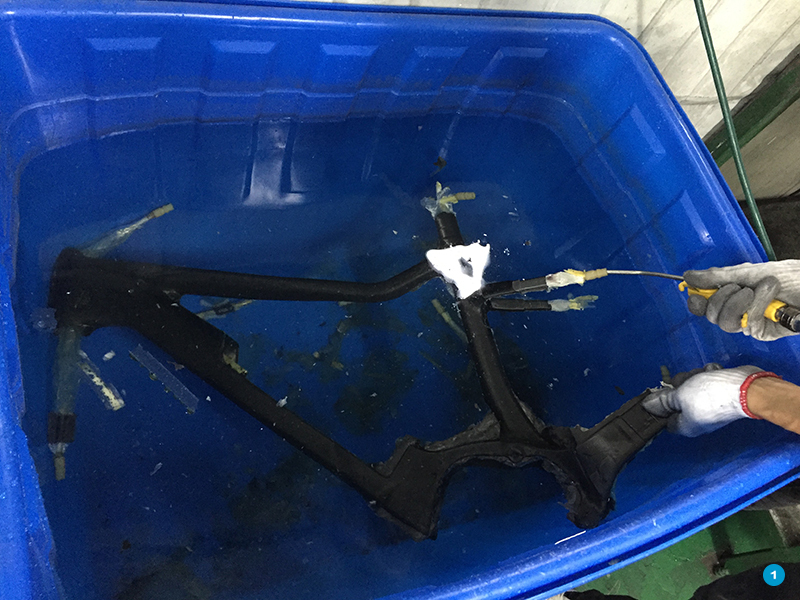 Put the frame immersed in water, fill the air into the frame by an air gun. 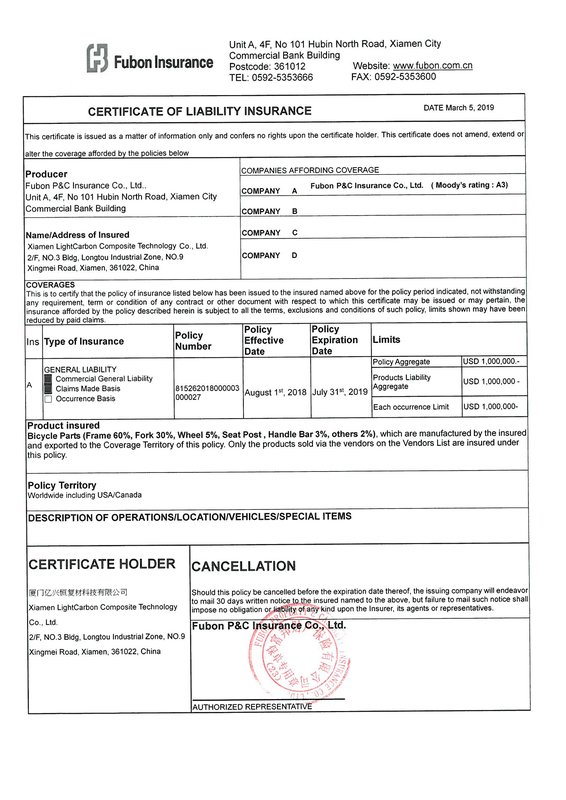 If no bubble then determination frame is in good condition, then transfer to the next step. 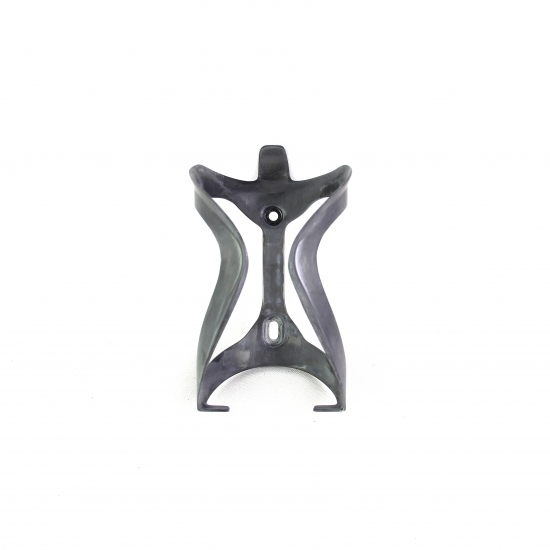 This step was the most strict QC inspection, leak products cannot be repaired and shipped, because the leak will affect the structural strength, only for scrap. 2. 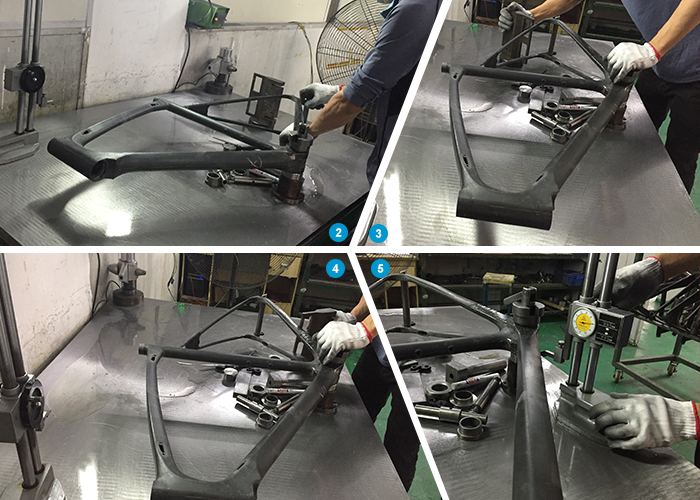 Check the flatness on the platform, fixed frame BB, with false hub fixed frame after claw, simulation wheel assembly on the frame. 3&4 images fix frame on the platform checked whether the left and right sides of the rear seat stay and chain stay are parallel. If OK, turn to the next process. Otherwise, return to repair. 5. Inspect the right side frame on the platform with precision height gauges, and adjust the height data to the center of the frame BB and return to zero. 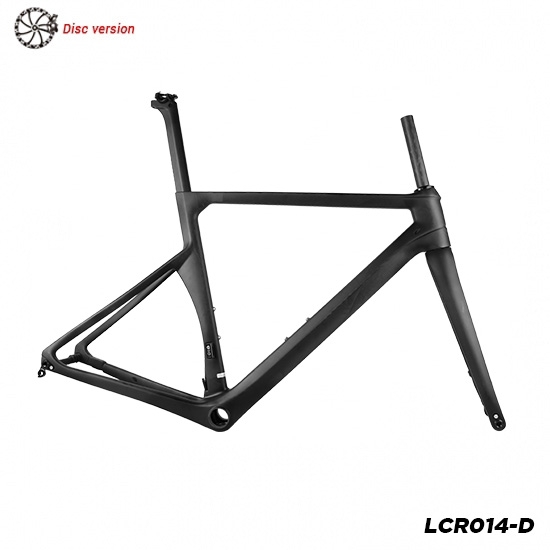 Check whether the center of the height gauge is on the same place as the down tube of the frame with tolerance 1.5mm if within this range determine OK, otherwise, it needs to be repaired. 7. 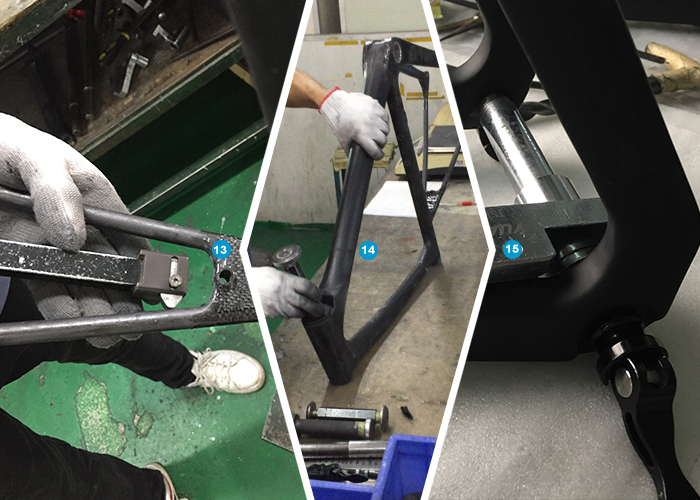 Use the same method as above step 6 to check the top tube. 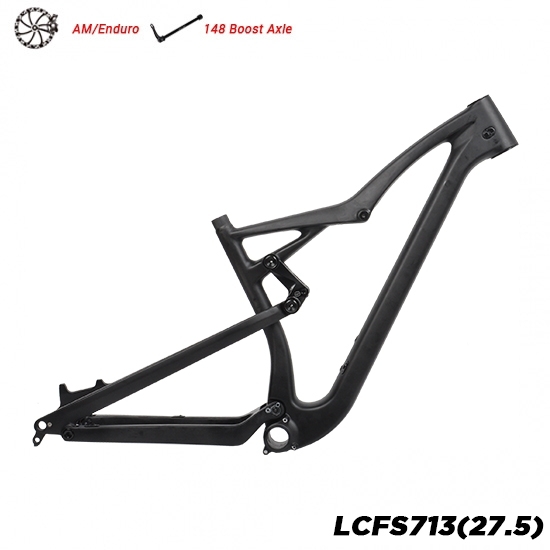 Above check items were for frame Alignment, If the front and rear wheels are not in the same center, the problem of wheel misalignment will occur. 10. 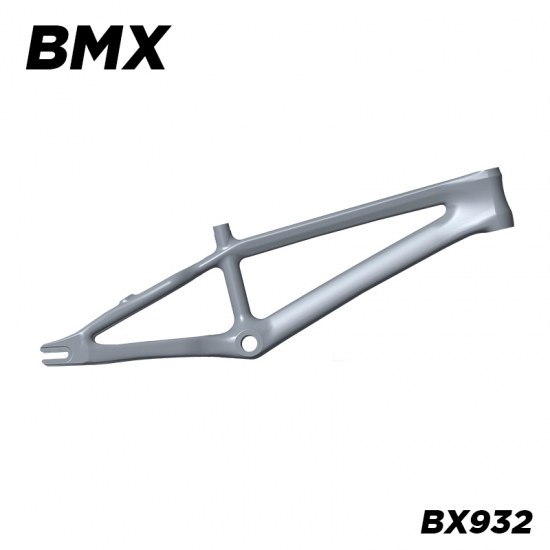 The height gauge is zeroed on the inner side of the right claw of the frame to confirm whether the center point of the rear stay width of the frame is on the same center line with the center line of the BB, the tolerance is 1.5mm. 11. 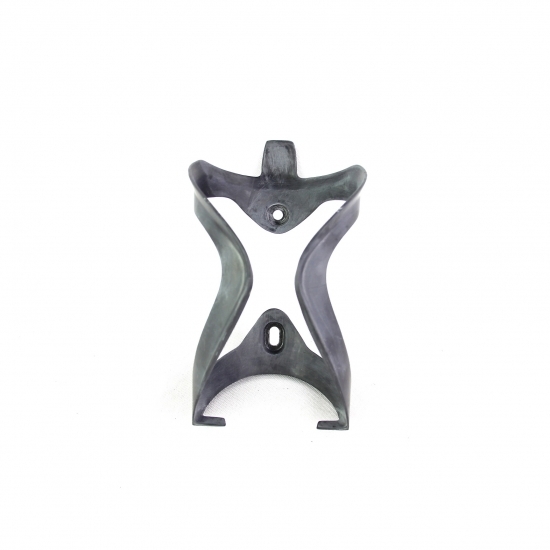 Check whether the left and right hooks are on the same plane with the checking fixture of the Hook groove plane. There is no tolerance requirement for this checking, but it is guaranteed to be on the same plane, such as the left and right hooks are not on the same plane after the wheel build up, there will be left and right deviation and will influence the ride. 12. When the left and right in pic 11 needed to be on the same plane, the tire position check mode of Fig. 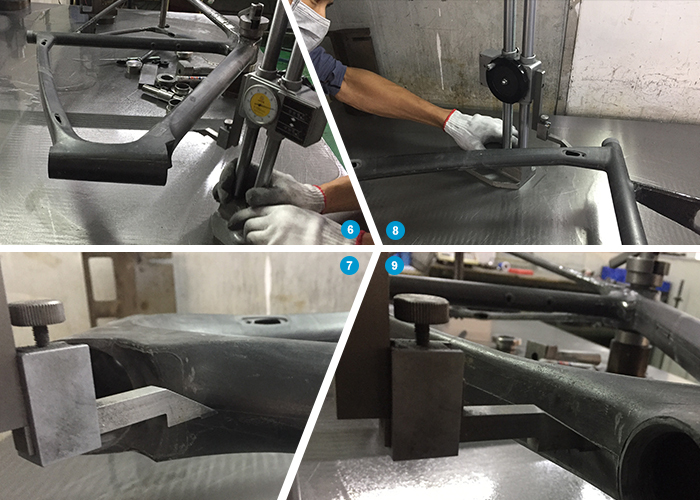 pic 13 was added, fixing the tire position meter in the frame check slot, and measuring the data on the left and right side of the seat stay That is, the value of Ar Triangle of A-B is less than 1MM (Road), and A-B is less than 1.5 mm (MTB). Otherwise, it needs to be fixed. 14. 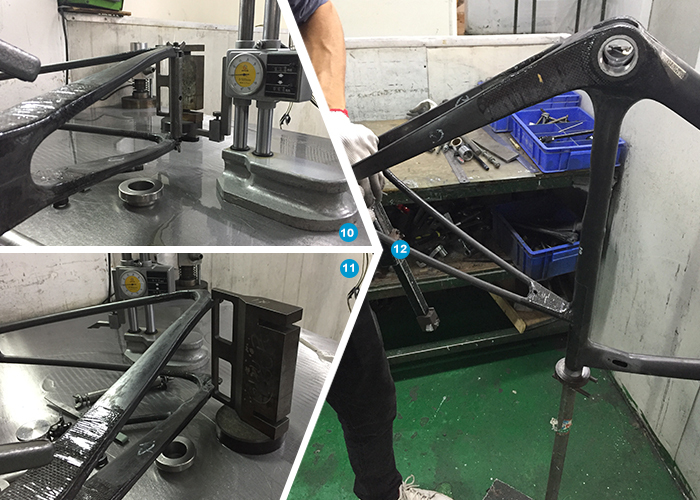 Check whether the head Tube size according to the FSA set standard production, this test way is GO / Ng. 15. 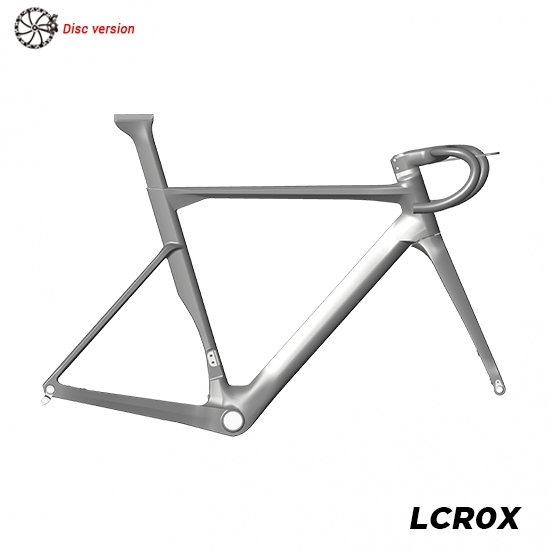 Check that the disc brake dimensions are made to Shimano specifications. This test is GO / Ng. 16. 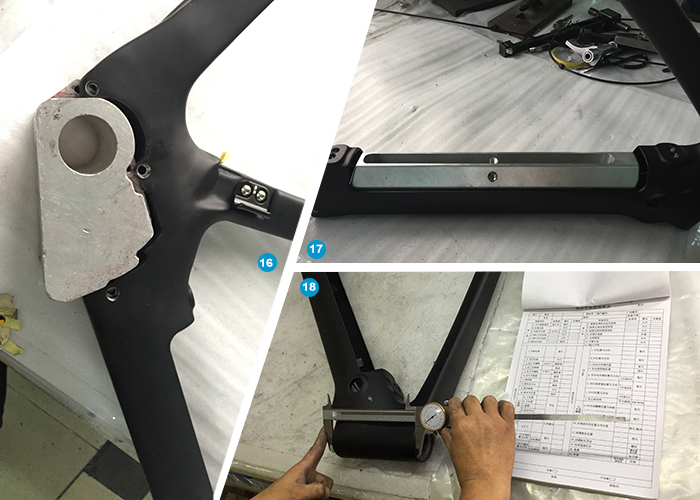 Check the E-BIKE frame motor assembly part of the size setting and battery mount uses the mockup jigs. 21. 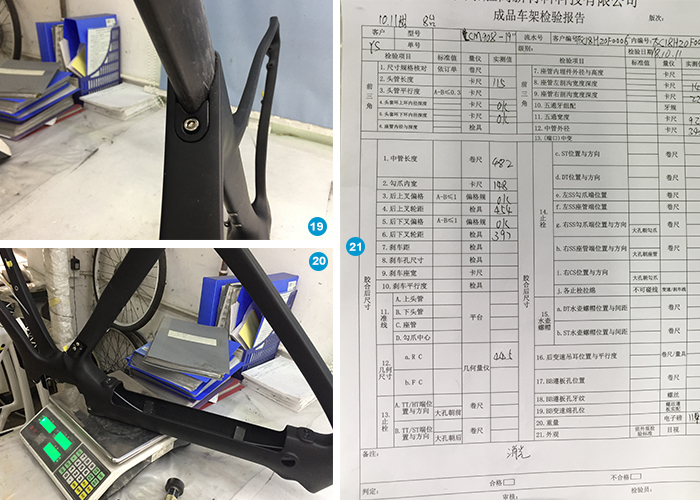 According to the frame design of geometric dimensions and tolerance inspection assembly size, and according to the structure design set weight standard 100% inspection, such as pic 18, pic 19, pic 20, the final inspection report each rack has a final shipping report, as shown in figure 21, which records the dimensions and weight inspected data will keep for two years. We also have insurance for our products.